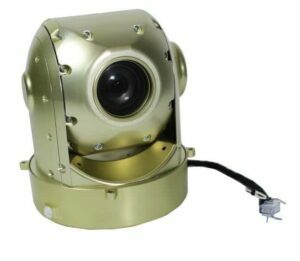 UAVOS has announced that it has developed a gyro-stabilized 3-axis gimbal for unmanned aerial vehicles (UAVs) with integrated RGB Full HD video camera and 30x optical zoom and Ethernet output. The gimbal has an extended operational temperature range and is designed to withstand harsh environments, featuring a compact size, low weight of 2.64lb (1,2kg), and a strong mechanical aluminium-cased structure. In addition, the gimbal integrates with UAVOS’ autopilot, allowing for the obtaining of coordinates of ground objects. Two axes of 360-degree stabilization offer the possibility to obtain images from any point of view. The third axis and precision stabilization provide high image quality at maximum 30x optical zoom. The gimbal is equipped with high-precision 17-bit encoders that provide excellent image stabilization and precision. The high degree of stabilization allows for the gimbal to be successfully operated on UAVOS unmanned helicopters in high-vibration conditions.